Following a British government plug-in grant scheme, £5,000 ($7,700) has been cut from the overall LEAF price meaning buyers can get behind the wheel of an entry-level Visia LEAF for £15,990 (about $24,000). For a top-of-the-range Tekna LEAF, with full battery purchase, its £25,490 (about $39,000). Three trim levels are available to UK buyers, the official press release from Nissan reveals. The Visia, Acenta and Tekna all "have increased boot space because of the relocation of the charging point and an enhanced interior trim." The 100% electric car is offering this new incentive to the UK market, calling the battery leasing models, "Flex". 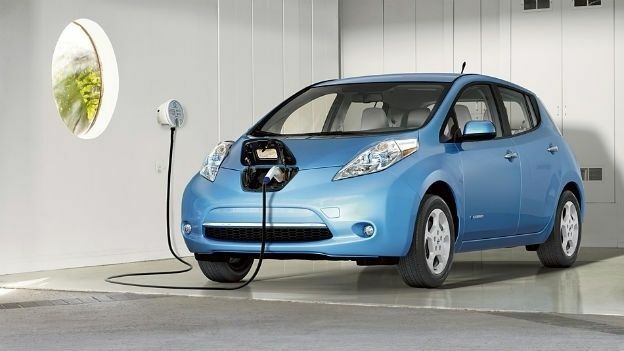 To lease out a battery, Nissan users can do so starting at £70 ($108) a month for a 36-month lease with no more than 7,5000 miles a year drive, and work their way up to £129 a month for a 12-month, 15,000-mile lease. Jim Wright, Manging Director of Nissan Motor (GB) Ltd, said in the press release: "With more than 100 improvements over the outgoing model, it really does mark the next stage in electric motoring revolution. Built at our record-breaking Sunderland lant for British drivers using British roads, we're looking forward to it becoming our next home-grown success story." Last year, Nissan revealed the new five-seater Nissan NV200 London Taxi in a big for more environmentally-friendly public transport. See the source below for the full press release, which contains the full battery leasing pricing structure.